ADU Series Dosing, blending units ensure precise and accurate dosing, blending of master batches in granular/pellets form for plastic processing, thus maintaining uniformity in colour. These units are fully automatic with features of synchronization with main extruder, injection molding machine. Microprocessor based Dega control to set inspection refill time for screw speed. Direct dosing screw eliminating separation. Easy to calibrate for accurate dosing. Reliable variable speed maintenance free motor & delivery system. Easy emptying for fast material change. Light weight construction with durable powder coat finish. Easy mounting facility for any processing machine. 24 DC, 110V AC and 220 V AC power option. 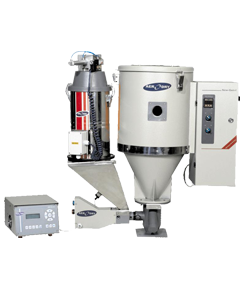 Synchronisation with machine ensures change of Dosing with changing speed of machine screw. Built in alarm an optional auto load facility. Can feed upto 200 recipe as per production need. Steel worm conveyors may be installed with diameters 12/16/20/24/30/35/40/50 mm. Special connector for signal from solenoid valve for press plasticising.